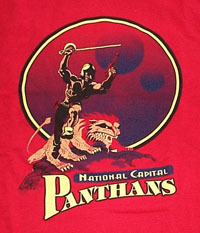 The National Capital Panthans is the local Washington - Annapolis - Baltimore area chapter of the Burroughs Bibliophiles, the worldwide organization of collectors of the works of Edgar Rice Burroughs. Our group came into being as a result of conversations between John Tyner, Bill Ross, and J. G. Huckenpöhler during the 1995 Dum-Dum in Rutland, Vermont. Beginning with a vague idea that "we ought to try to get together from time to time," and drawing on the database maintained by Bill Ross for his fanzine, The ERB Collector, the concept has now expanded into a monthly gathering of 10 to 20 local collectors, with occasional guests from as far away as New York City, Memphis, Tenn., Jupiter, Fla., Sacramento, CA as well as the U.K., Canada and Germany. Our Panthan Newsletter (which covers the activities at the most recent meeting and location and date for the upcoming month's meeting) is available as a file to members who have an email address. The Panthan Newsletter is the result of a cooperative editorial effort between J. G. Huckenpöhler and Bill Ross. The meetings and refreshments at members' homes are contributed by the host. Our other publication, the National Capital Panthan Journal which first appeared at our organizational meeting in September 1996; goes only to those attending the meeting and/or submitting contributions. Depending upon what members have to contribute in any given month, the Journal may contain as few as 20 pages or as many as 60. Contributions may include fanfic, notes downloaded from the Internet, artwork from our professional artist members, movie reviews, or cover paintings from foreign language editions. Any member of the Burroughs Bibliophiles is welcome to join our group and receive our newsletter; and, if you happen to be in the area on the first Sunday of the month (see schedule) give one of us a call or an e-mail and we will be happy to have you as a guest at our next meeting. You can also reach us at our snail mail address which is John Tyner, Treasurer, National Capital Panthans, P.O. Box 673, Rockville, MD 20848-0673.